Hypericum perforatum is native to Europe and temperate Asia and has been naturalized in North America. It is associated with St. John the Baptist because it blooms around his birthday, June 24, and the plant seems to bleed red oil around the time he was beheaded in August. The word Hypericum may come from the Greek word hyper meaning above and eikon meaning picture because the flowers were placed above religious images to ward off evil at the northern midsummer festival on June 24th. Wort is the Old English word for root. Another guess as to its name is that the Knights of St. John of Jerusalem used St. John's wort to treat wounds on the Crusade battlefields. It is also associated with witchcraft. On the Isle of Wight, if you step on it at twilight, you might be carried off on a magic fairy horse and not return until daylight. Harvest and Use: Before the 19th century, St. John's wort was considered a remedy for nervous disorders, gastric problems, uterine cramping, anemia, and worms. Its medicinal use has recently been revived, especially by the Germans, as a treatment for nervous complaints and mild depression. Rather recently, this roadside weed attained notoriety when the media in the US picked up the news that it was a cure for mild depression. Within a very short time, it became a mainstream herb along with Echinacea. 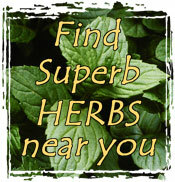 It was also instrumental in promoting herbs as alternatives to conventional medicine. 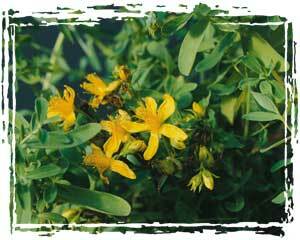 Medicinally, St. Johnswort is presently used as an infusion to soothe the digestive system, for anxiety, nervous tension, irritability or emotional upsets, especially if associated with menopause or PMS. The tincture can be used for long-standing nervous tension leading to exhaustion and depression and for childhood bedwetting. Take for a period of two months. It can also be used as an antiseptic wash for skin sores and bruises or made into a salve for the same purpose. Use the infused oil or salve for burns and muscle or joint inflammations, including tennis elbow, neuralgia, and sciatica. The flowers are the part of the plant that is used to make infusions, and the aerial parts of the plant are used to make tinctures. The best time to harvest the flowers is midsummer on a dry morning. That's when the oil content is highest. Harvest the aerial parts of the plant in the fall by cutting 2-inches above the ground with a hand pruners. Caution: It can cause dermatitis after taken internally then exposing the skin to sun. Harvesting or pruning the plants when they are moist and in the sun can cause contact dermatitis. It is recommended that you NOT take St. John's wort with any anti-depressant drugs unless you are working with a physician to gradually wean yourself from the drug while slowly increasing your dosage of the herb. Cultivation and Propagation: St John's wort is an upright perennial, woody at the base, with oval leaves. It grows to about 2' with a spread of 18". Yellow, 5-petaled flowers appear in mid July. The creeping, yellow-brown roots send out runners, but it is not invasive. It is hardy to zone 4, is not fussy about the pH of the soil, and will tolerate average to poor soil in full sun or partial shade. If you look closely at the flowers, you will see little red dots. Picking the flowers will turn your fingers and the oil you infuse them in, a blood red. It grows wild and can easily be wildcrafted, but growing your own allows you to control how and where it is grown and harvested. There are also strains developed for their high content of the active medicinal ingredient, hypericum, that you may wish to grow. The seed is difficult to germinate because it has to go through a cold period to break dormancy. This is called stratification. It is best to buy plants from a reputable nursery.